If you have to deal with vertigo on a recurring basis, you can probably relate to the main character in our story. We’ll call her Alex. Alex suffered from vertigo for decades. She dealt with a debilitating spinning sensation that seemed like it could strike at any moment. Sometimes she was afraid to drive, and vertigo had even caused a couple of near misses when she fell – once in the shower and once while trying to vacuum under the couch. Does this seem like a tale you can relate to? It can be tough to understand the anxiety that Alex was facing unless you too deal with idiopathic (the cause is not known) vertigo. Every time she stood up, there was that hint of doubt. Would vertigo strike this time? How will I keep myself from falling if it does? Which way would be the safest to fall without injuring myself? It can wear on a person’s psyche to have to think about those question when performing the simplest of activities, standing up. Add in a couple of actual falls, and now the anxiety can amp up until it exacerbates the problem because anxiety and stress can trigger bouts of vertigo. Do you find yourself dealing with a similar cycle of trepidation and anxiety? 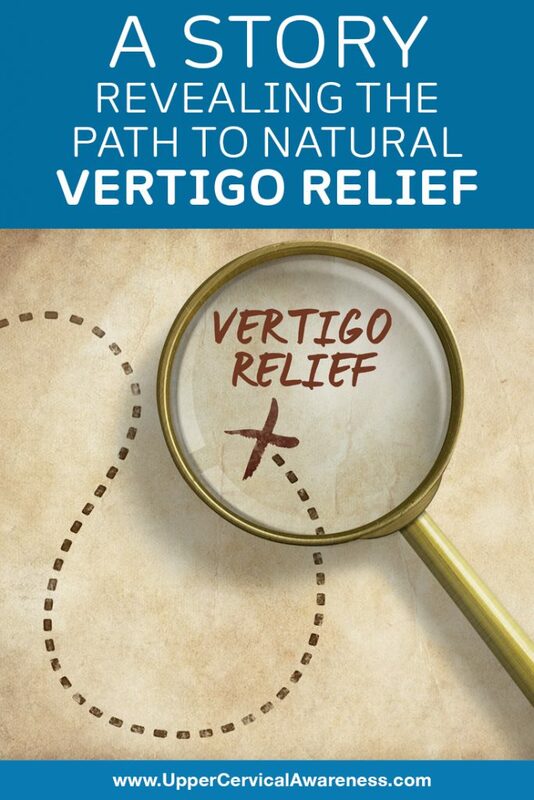 You probably realize that there are limited options for the treatment of vertigo. Most treatments offer symptomatic relief. For example, if you get particularly bad nausea with your vertigo, a prescription may be offered to help keep you from vomiting. Other forms of care are very hit and miss. If Meniere’s disease is the underlying cause of vertigo, a low salt diet may be recommended. For benign paroxysmal positional vertigo, you may try the Epley maneuver or some other form of canaltih repositioning. But what if those methods don’t work? That was the situation for Alex. She was growing despondent, thinking that she would never find a way to get out from under the burden of vertigo. Has that been your experience as well? Does it seem like this is just something you will have to deal with for the rest of your life? One day, while surfing the Internet, Alex discovered an article that talked about upper cervical chiropractic care and how it helped resolve a patient’s vertigo. Continuing her search, she found case studies that showed upper cervical chiropractic has literally helped hundreds of people to find relief from severe vertigo. But how does the neck relate to vertigo? First of all, the atlas (C1 vertebra) is located at the base of the skull, directly between the ears. A misalignment can thus affect the ears. Since the ears are responsible for much of the body’s balance system, this is usually the source of vertigo. Vertigo can also be related to central nervous system (CNS) function. Since a misaligned atlas can put pressure on the brainstem and affect blood flow to the brain, a properly aligned atlas is a must for optimal CNS function. After doing more research, Alex was pleased to find an upper cervical chiropractor nearby her home. Would she see the same results as so many other patients in case studies? She decided it was worth a try. If you feel the same way, a quick search can reveal if one of our preferred upper cervical practitioners is in your area. Alex was surprised that an extensive patient history was taken on her first visit. She indicated on her paperwork that she had experienced a concussion after falling off a horse about 15 years ago. The doctor asked a lot of questions about the injury, the care she received, and how long after then injury her vertigo began. The practitioner seemed convinced that this was the start of all her troubles, but there was only one way to know for sure. Sure enough, diagnostic imaging identified an atlas subluxation. The upper cervical chiropractor took precise measurements of it and then gently adjusted her neck. It was like nothing else Alex had ever experienced. There were no cracking sounds or violent jerking of the neck. In fact, the correction was so gentle that Alex was a little worried she had been scammed. Her concerns faded away, however, in the coming weeks. Within about six weeks’ time, it was clear to Alex that her vertigo bouts had grown few and far between. She was determined to keep her future upper cervical chiropractic appointments to make sure her adjustments would hold. This would give the body even more time to heal. Perhaps the vertigo episodes would completely resolve with just a little more time and patience. In the meantime, Alex felt like she had gotten her life back. The intense feeling of dread that vertigo could attack at any moment was becoming a thing of the past. Is this the Natural Solution for You? You may think that our story about Alex is just a nice dream. However, hundreds have attained relief from vertigo in case studies, and upper cervical practices have their own testimonials showing that these results are being duplicated every day. If you are experiencing recurrent bouts of vertigo, especially if you have a history of head or neck trauma, contact a practitioner to schedule an examination today, Upper cervical chiropractic may be just the natural help that you have been searching for.